Former OLSD student Jahred Perry, who has autism, speaks about his evolution during a session at last year’s conference. 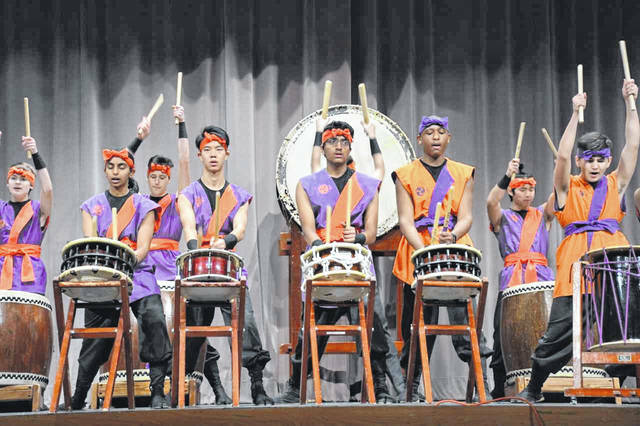 The Dublin Taiko performs the Japanese drumming art during the One Community Conference, which is centered on equity and inclusion. As the Olentangy Local School District continues to grow at a fast pace, so, too, is the level of diversity that is seen within the schools and communities. Because of that growth, never has it been more important to promote inclusion among students and community members, which is what the district hopes to do at the 2019 One Community Equity and Inclusion Conference. Held on Saturday, Feb. 2, at Olentangy Berlin High School, the fifth annual One Community Conference will seek to generate dialogue on diversity and how to best support students from any and all backgrounds within the schools and also at home and in the communities. Of course, diversity isn’t constrained within any one district, and there is an emphasis on bringing together people from all around central Ohio and beyond to take part in the event. John Krownapple will be the keynote speaker this year. Krownapple specializes in facilitating professional learning and organizational development focused on social justice, equity, diversity and inclusion. His presentation — “Dignity: The Key to Community” — will address the keys to relationships, equity and inclusiveness. Attendees can choose to attend the entire day’s activities or pick and choose which sessions and discussions they would like to hear. Jackie Powers Merkle, the curriculum supervisor of equity and inclusion for the district, said there has been a significant transition within the district over the past 10 years, where the area was once “highly rural and predominantly white.” Now, she said, the district has seen an increase in students from all types of backgrounds, particularly with Indian descent. Organized by OLSD’s Diversity Team, which is primarily made up of Merkle and Diversity Coordinator Heather Cole, this year’s event is expected to be the biggest yet, partly because the 2019 conference will offer an additional session than in previous years. Two weeknights used to suffice for the event, but Merkle said the consistent feedback each year was asking for more events and sessions. She added that one of the main things that will separate this year’s event from those in the past is a global symposium for high school students. Students from surrounding school districts have been invited to the conference to create conversations about immigrants, refugees and new Americans. Sessions have also been added that are specifically designed for elementary and middle school students that will allow them to engage with students within the district and from surrounding districts. With sessions geared toward all ages of students, and childcare available for children as young as 3 years old, One Community Conference is set up to accommodate all families. Merkle went on to say she believes that, for the people who do live within OLSD, it is important to come out and support the people who are participating in the event and who also live the issues every day. The event is entirely free to attend, but those attending are asked to register beforehand. Attendees can do so by visiting www.olentangy.k12.oh.us and scrolling down on the home page to the One Community link. A link to the conference brochure, which highlights the more than 40 workshops that will be offered, as well as all other opportunities for the day, is also available by following the homepage link.